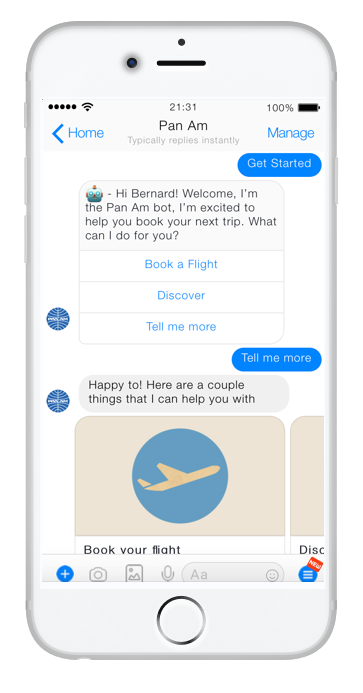 A Designlab project, the Pan Am Chatbot focuses on providing a delightful mobile experience with features and amenities for the modern traveller. As part of my course at Designlab, I designed the Pan Am chatbot. A hypothetical revival of an iconic brand, Pan Am promises an elevated, thought-through experience. I was tasked with creating a solution to develop a mobile-first experience unique from its competition in true spirit of a Pan Am revival. 2016 was projected to be the first year where more than half of all online bookings for U.S. travellers would be completed on a device or tablet. [Source: Skift] While desktop still brings in greater overall sales (big-ticket, considered purchases are often the last to shift), a future-focused airline needs to imagine a mobile-first future. Pan American World Airways in an airline that is relaunching in 12-18 months, and are looking for a tight, well-thought out user experience to match. 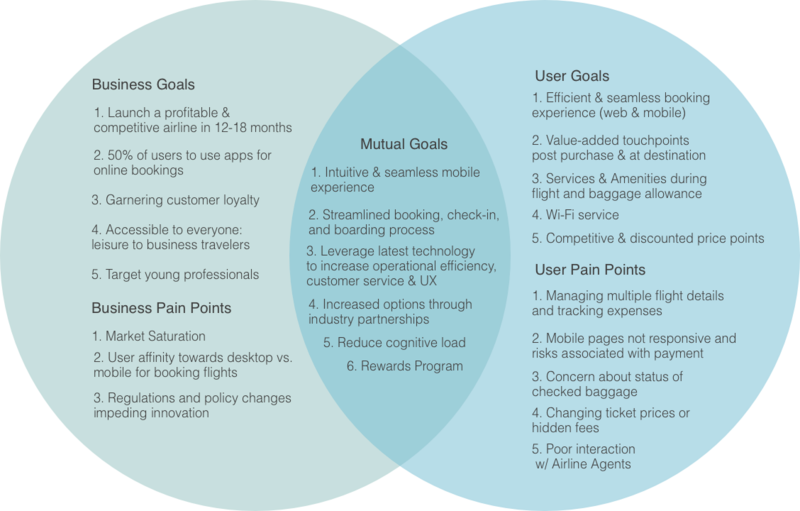 For the discovery phase, I conducted in-person interviews to identify the goals and objectives for travelers, secondary research, and competitive analysis of current airlines and their mobile experiences. These methodologies were able to help me understand the behaviours and pain-points of travelLers as well as how the user experience can be improved through the booking process on a mobile device. 1. Who are Pan Am’s target customers? 2. 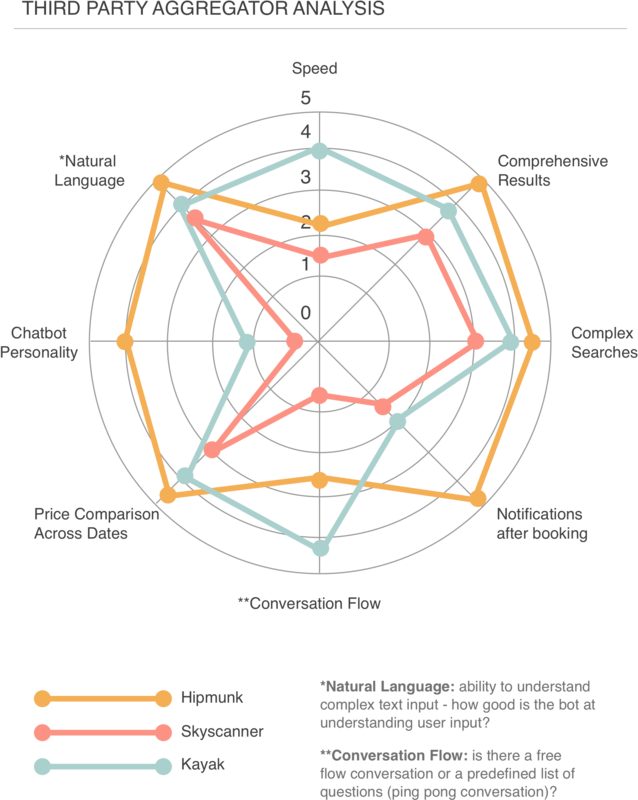 What are customer’s priorities when booking flights? 3. What common frustrations and paint points do travellers face when booking flights ? 5. How can Pan Am differentiate itself from competitors? Below are some of the key findings from my user interviews. These interviews were conducted with participants who travel regularly throughout the year to gain insight into their preferences and attitudes towards booking flights online. My findings were able to provide me with a better understanding of patterns and behaviours in the process to book an airline flight. 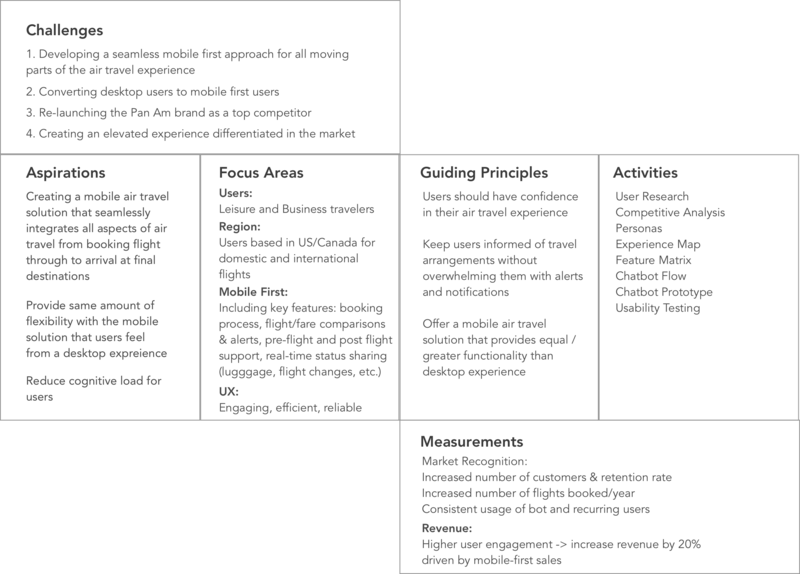 From my research findings I further detailed the goals and pain points for both users and Pan Am and outlined shared objectives, taking mobile constraints into consideration. 1. Answering common questions: What gate does my flight depart from? Limit for carry-on? When is the next connecting flight? This helps the user save time and for airlines to automate part of their engagement process. Users can still be redirected to human agents for additional help. 2. Searching, booking & payments: Facebook Messenger supports the capability to perform complex tasks such as searching for flights and handling booking & payments. This gives users the opportunity to get the information they need without having to leave Messenger. 3. Consolidating information and edits to trip: a full-stack chatbot has the capability of storing all critical flight information in one place: Facebook Messenger. This eliminates the need for users to switch back and forth between browsers, email, passport, boarding pass and the need to download various airline apps. Why a Facebook Messenger chatbot over a standalone app? Messenger has 1.2 billion users globally. The prominence of the platform means users will have a seamless way to access the chatbot. 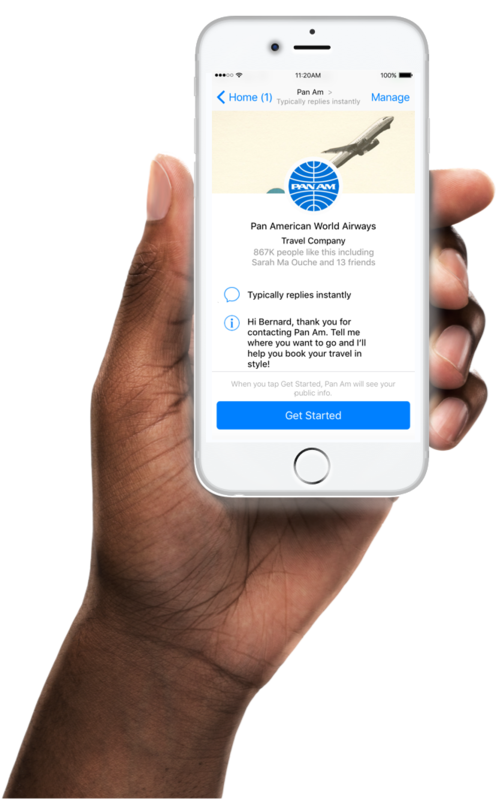 The aim with the Pan Am chatbot is to create a continuous and interactive experience that can be more effective than inundating the user with another standalone app. 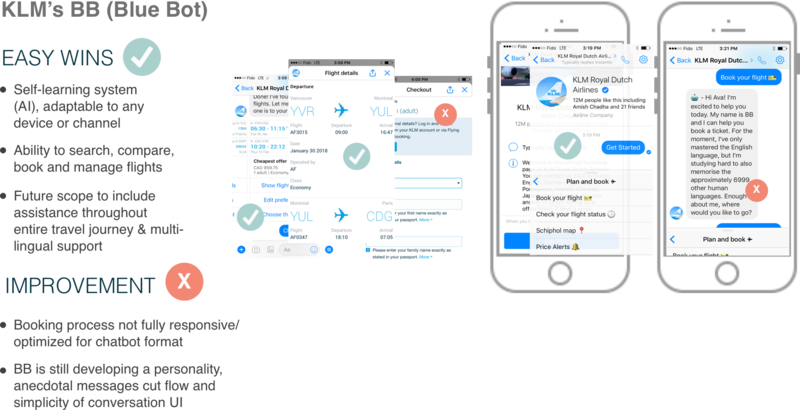 For the competitive analysis, I decided to evaluate the current airlines in the market that have developed chatbots as part of their travel experience. Each have differing functionalities, some chatbots aim to cover the end-to-end travel booking experience in their scope, while others focus on specific use cases such as answering FAQ’s, facilitating check-ins, giving users access to their flight information or personalized alerts. 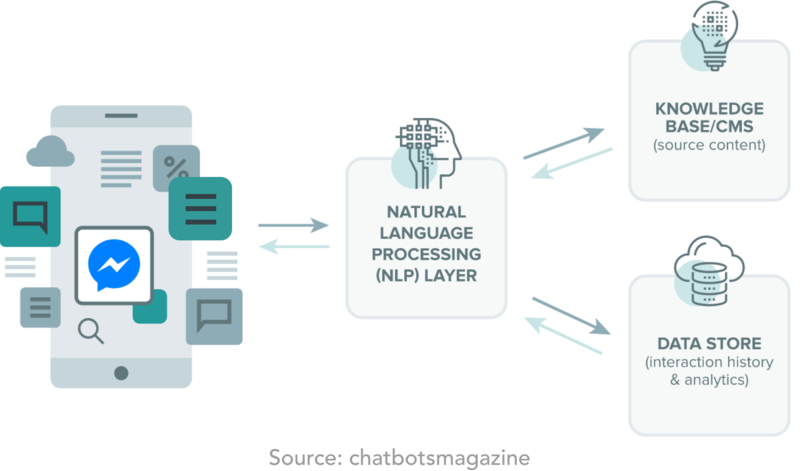 I also assessed third-party aggregators to understand how chatbots such as Hipmunk or Skyscanner’s bot have developed their conversation flow and whether they are capable of understanding complex text input. I created a UX Strategy Blueprint to help organize the goals and focus for the project moving forward. The primary challenge for the Pan Am chatbot is to provide an air travel booking experience that is mobile first and more seamless than desktop booking. I referred back to my user research interview findings to help guide me through the challenges, focus and guiding principles. 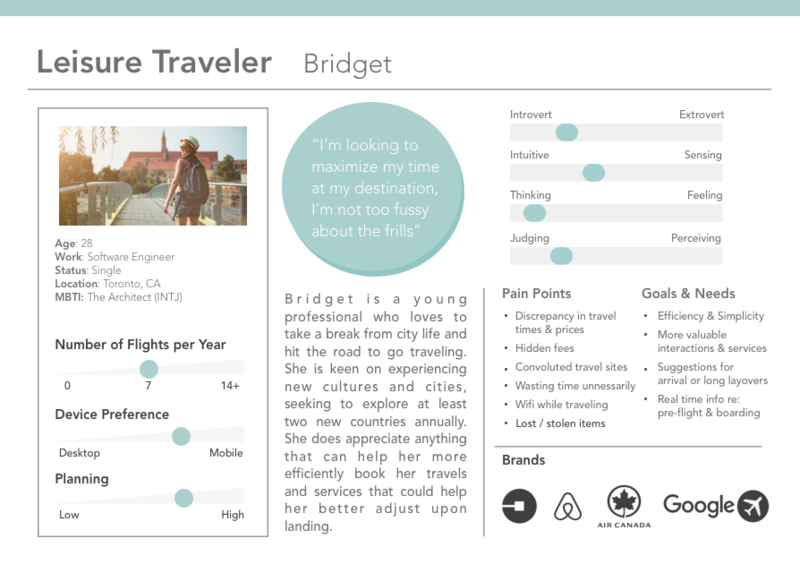 After reframing the design objectives based on the research findings, I created two personas to better understand and empathize with the users. 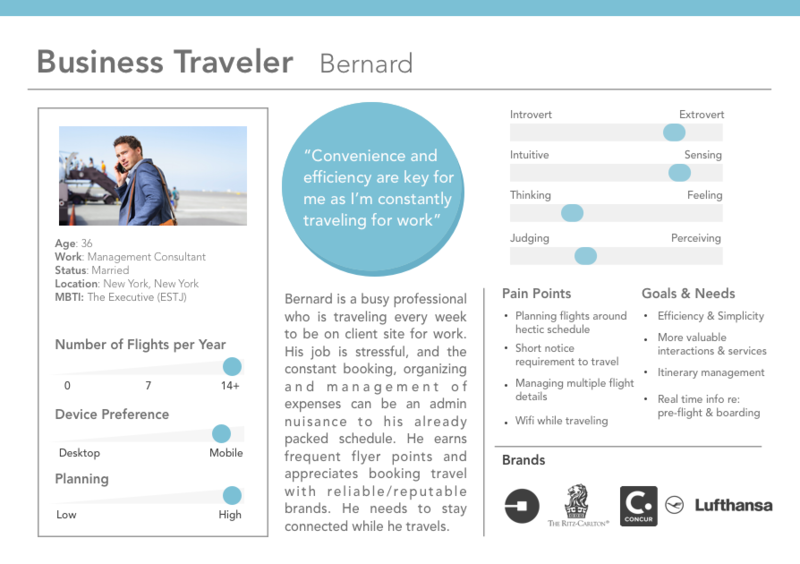 My personas were a reference guide helping me to personalize the data and insights that I gathered during my research. By using the insights I generated from the research phrase, I created a chatbot flow to map the the searching and booking process for the bot, including some potential actions and their corresponding message strings. I developing scripts for the Pan Am chatbot which proved to have its unique challenges to create a logical flow of conversation and the difficulty in string messange trees that can handle complex user input. I initially started off with a pen and pad converastion tree that I tested with 2 users to help refine the chatbot flow. For the scope of this project, I focused on a simple and pared down engagement below. As a next step, I would like to further test this chatbot with live users to refine the conversation flow and to complete the checkout process. Further steps would also include expanding the scope of the bot and building conversation flows specifically for pre-boarding and help upon arrival to destination, as well as fleshing out more of the bot's personality. The aim for the Pan Am chatbot is to provide an end-to-end conversation covering a greater scope covering all aspects of air travel. This was a core starting point to assess a base functionality, before building more complex features differentiating Pan Am from the market.